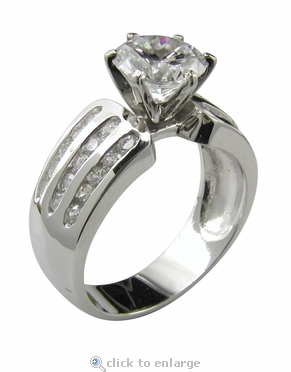 Our Xena 1.5 Carat round Cubic Zirconia Three Row Channel Set Solitaire Engagement Ring features a 1.5 carat 7.5mm round brilliant diamond look cubic zirconia set in a die struck six prong classic style head. Three rows of channel set rounds line halfway down both sides of the shank and beautifully accent the 1.5 carat round center cubic zirconia. The hand cut and hand polished Russian formula cubic zirconia coupled with a high quality solid 14k gold mounting gives you the best possible finished product. 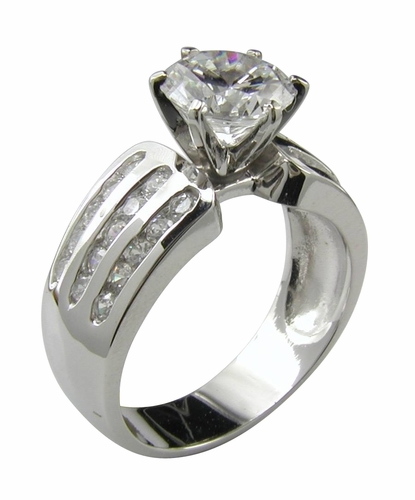 This solitaire engagement style ring has a comfortable fit and gives a really important look on the finger due to its width as well as all the channel set accents stones on the shank. The ring measures just under 8mm in width. The total carat weight on this ring is approximately 2.5 carats total weight. Due to extremely low pricing, all clearance sales are final. This clearance items may be sized for an additional fee of $35. Simply type in your request in the comment box at the end of the order. Sizing below a 5 or above an 8 is subject to additional fees. Please call for a quote.